This is a very sensitive topic, and so I’d like to start by saying just how tragic this accident was, and that my thoughts are primarily with the victims and their families. Anyone who’s bothering to read this will already be familiar with the accident, but I’ll summarise it, including all the safety aspects that were or should have been considered. On the 2nd June after a routine breakdown, the record-breaking 14 inversion ride was tested using empty trains before allowing riders back on. This is a regular occurrence on all rides; sensors are often triggered erroneously and so as a failsafe the ride shuts down. It is then briefly tested empty before operation resumes. However, in this case the final test train stalled in an element called a ‘Batwing’, which in itself is a nuisance, but a very solvable problem; normally a small crane will be used to pull the train around the track and back to the station. Because a roller coaster train moves purely under gravity once it has disengaged the lift hill, any coaster can theoretically valley; if winds are strong enough or there is some kind of impact, eg. a bird strike (although obviously it would need to be a very large or fast bird). And so every ride has to be designed to deal with this. What happens is that the next car should not be able to enter that section of track until the car it’s following has exited it. This is done by setting up ‘blocks’: regions where the car can be controlled entirely. Typically this is just the station and the lift hill, and often a small stretch of track just before returning to the station (you’ll remember those times when you’re waiting for ages for the train in front to leave the station so you can get off). Sometimes there will be a brake run mid-ride which acts a divider; a car can be fully stopped on it if the next car has stalled. 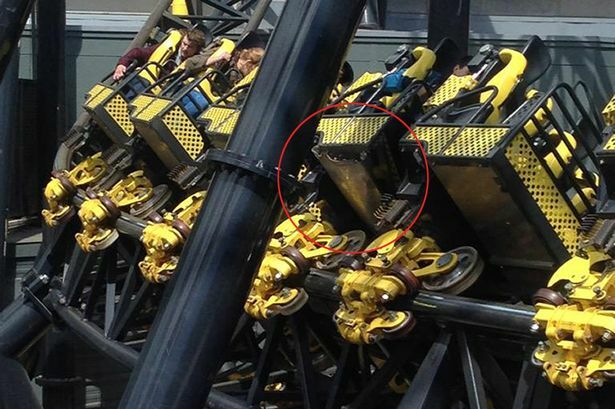 (This is the case on Saw – The Ride at Thorpe Park for example). This is usually to increase the rider throughput; either on long rides where the time for the car to complete the circuit is more than that to load the next train, or on rides with very small trains (like Saw). The Smiler is an example of both of these, and also benefits from the visual aspect of two trains ‘duelling’, and so runs up to four cars at a time. In this case the previous train had come nearly to the top of the first lift hill, and as expected stopped once the valleyed train had been recognised by the ride’s system. However, what exactly happened next has not yet been revealed, but the result was that after a delay of around 10 minutes the train on the lift started moving again and was released onto the track. It collided with the empty train at about 20mph, which is far slower than the ride’s top speed of 52mph, but since the trains are not designed to take such direct impacts (the ride’s system should be enough of a failsafe to prevent this), the front of the full train crumpled, seriously injuring the four passengers on the front row and one on the second, with the eleven others sustaining less serious harm. As of two days ago, a man and a woman (the woman having sat on the second row) had been released from hospital, another man remains in hospital with two shattered knees, and most devastatingly two women have each had a leg amputated. 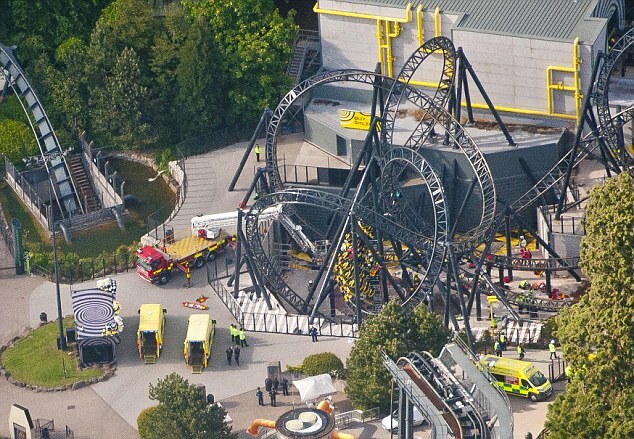 Such an incident is completely unprecedented at Alton Towers, and although there are one or two deaths on roller coasters each year, these are usually due to underlying health conditions such as heart defects, or overweight riders who are not correctly secured in their seats (1). Occasionally the ride attendants fail to correctly ensure the riders’ restraints are locked, as was the case in the last fatality in the UK, on Hydro in Oakwood, Wales, but a true hardware/software error is unbelievably rare. Aside from the accident on Mindbender at Galaxyland in Canada in the 1980s (2), this is probably the most unbelievable theme park accident in modern history, despite the lack of fatalities, due to the stature and safety record of Alton Towers and its owner Merlin Entertainments, and the young age of The Smiler itself. What should’ve happened is that the loaded train would be evacuated, and the valleyed train would be returned to the station with a crane. There are a number of options as to what happened, but all Alton Towers have said is that it was due to a ‘Unlikely sequence of circumstances’. The first option is that the ride operators didn’t realise the train had valleyed (the station is inside so the track cannot be seen from the control booth, although there is plenty of CCTV), and assuming that the ride was misbehaving again they manually sent the train on its way. I am not 100% sure, but I would be incredibly surprised if this was possible. Perhaps for an engineer, if they reprogrammed the ride’s software, but for an operator, who would realistically only know how to operate the ride on its usual settings, there would surely be no way to override the safety systems. There’s just no reason for it; the chances that someone accidentally hits the wrong button are far too high (this is what happened at the Three Mile Island nuclear incident in the USA).The second option is that the computer simply malfunctioned, which I guess is plausible, but I would imagine that would result in the entire ride shutting down. The two final options are more intriguing. In order to evacuate a train on a lift hill there is usually a walk way down one side of the track; harnessed engineers will walk up and help the passengers down. The Smiler does have this, but it also has a very novel system that may have caused its downfall. Most rides have a little notches on the lift hill which prevent the car from rolling backwards if it stops (that’s the clicking noise you hear; it’s not the chain itself but the train catching onto each ‘hook;). However The Smiler instead has a series of magnets, which you can hear dropping down as you pass over them. This means that unusually the train can be reversed back into the station from the lift by sequentially disengaging the magnets. One is theory is that the ride shut down correctly, but the operator then incorrectly sent the train up the hill rather than down. Once again, it seems unlikely that the computer would allow the train into the block with the valleyed train. What I believe happened is that the ride system shut down, and upon being rebooted in order to retrieve the lift hill train it cancelled all knowledge of the valleyed train. It is likely that once the system sees that a train has valleyed, it assumes it will be removed before the ride is restarted. Since there is no knowledge of exactly where the train is within a block, only which block it is in, once the system was restarted it is possible that it had no sign of a problem and so proceeded to release the lift hill train. At this point the train was far too close to the apex of the lift to be stopped, and so the tragedy occurred. With hindsight, the train should’ve just been evacuated manually, or the valleyed train removed first, and it demonstrates just how much of a problem over-engineering can be; there is really no need for a magnetic rollback system on the lift. Every time I think about it I try to be as objective as possible, and I find it very hard to believe that if I were in the position of the victims I would harbour anything but anger towards Alton Towers and Merlin. When I talk about the accident to people I feel like I’m coming off like a pro-gun lobbyist; I can quote accident statistics for cars and planes all I like, but ultimately roller coasters are far less necessary than transportation is. The added horror is of course that these attractions are designed to feel like you’re in imminent danger, and that’s a major part of the thrill. 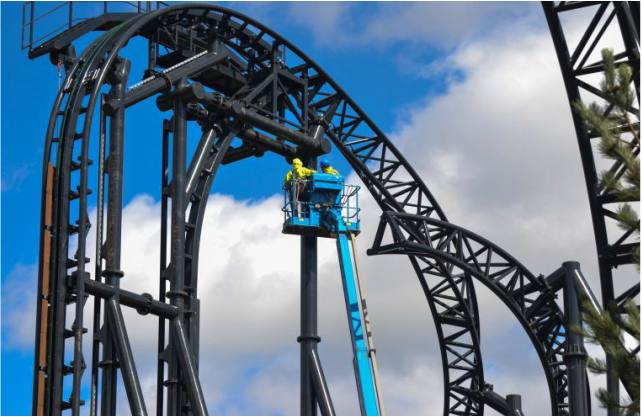 It has been highlighted a number of times that were problems with The Smiler right from its conception; Gerstlauer, its manufacturer, have had a few problems in the past with reliability, and this ride proved to be their worst in this regard. Early on there were train stalls, mainly because the ride’s numerous loops are taken so slowly (to minimise G Force), but this hadn’t happened recently. There was also a case where the track separated slightly, and one where a wheel fell off, but although these were all considerable issues, they were isolated and dealt with exactly as designed. This accident is unrelated (aside from the more fundamental problem of the train stalling), and in my opinion the previous problems shouldn’t contribute to the verdict of what happens to the ride (although they probably will from a financial perspective). I’d really rather not mention Kay Burley, the Sky News ‘journalist’ who hosted a terrible interview with Nick Varney, Merlin’s CEO, since I’m giving her the attention she craves. There’s been a much publicised petition to sack her, but realistically she’s more likely to get a promotion since the main objective of any news station is to increase viewership. People initially touted the interview as some kind of mauling, but if you watch it it’s actually just her asking the same question over and over again. Varney doesn’t quite answer it properly, which is a shame since there is a fairly obvious answer. That’s probably down to the pressure of the situation; he’s a CEO not a PR spokesman, and he actually handles himself very well. Nick Varney had become a little disliked amongst the enthusiast community for not building us our goddamned wooden roller coaster at Alton Towers, but my respect for him has skyrocketed. Her first ridiculous suggestion was that the ride was being dismantled as they spoke (just days after the incident), and this could’ve been rebuffed by simply telling her how stupid it would’ve been to remove it before the cause of the accident had even been identified. If she’d followed up by insisting the ride be removed once the cause was found, he could’ve answered (truthfully) by stating that if the error was unfixable, the ride would be removed, if not it would be rectified and eventually reopened (which is what I imagine will happen). Her repeated argument, which she failed to articulate, was that if Alton Towers were upgrading the safety protocols on other rides, this would suggest that they were not as safe as they could’ve been beforehand, which logically must be correct. Her question simply is ‘Why were these rides not as safe as possible already?’ The simple answer is because another layer of safety can always be added. Take the example of a seatbelt in a car. It improves safety, but ultimately it can fail, and people do die in car crashes due to seatbelt failure (3). So why not wear two seat belts? Sure, cars don’t come fitted with two, but it wouldn’t be particularly difficult to retrofit another to each seat, and the chances are Kay Burley doesn’t do this despite her overwhelmingly safe mentality. You could just keep adding seatbelts ad infinitum, and the layers of safety on a roller coaster are more likely equivalent to about 50 seatbelts. You can always do one more safety check before releasing the train. The very room she’s sitting in has a higher chance of collapsing (4) than you are likely to be injured on a roller coaster. And yet, she’s not wearing a hard hat? I will keep insisting that rides are as safe as anything could possibly be, and the systems are designed to categorically prevent anything like this from happening, but the simple fact is that this did happen. The exact cause may never be disclosed to the public, but the fact that Alton Towers have seemingly shouldered the responsibility rather than blaming the manufacturer, Gerstlauer, suggests they are the ones at fault. There have been dozens of rumours claiming the ride will be dismantled, but the truth is other rides have survived much worse (see Mindbender). Most people anticipate at the very least a complete overhaul and retheme will happen. I personally think a retheme would actually be the worst option; painting the ride red and calling it ‘The Happy Magic Coaster’ (for example) just makes it look like a very bad sweeping under the rug. I imagine the ride will reopen still as The Smiler, probably with a new train design, but all external advertising will be stopped. Alton have plenty of rides to put on posters and cereal boxes, and their next roller coaster seemed to be due for 2017 before the incident occurred; if they continue with those plans they’d have a new flagship attraction to publicise. But only time will tell. The most important thing is that Alton Towers, and all parks across the world, learn from the incident, and improve on a safety record that already makes the theme park industry one of the safest in the world.